No need to add a thing. Match the description to the image. This is a very UnFrank-like comment. Did I write it for you? I wrote it with Elysian influence. Well, dang, I liked this one because it shows four ugly white guys with ridiculous or smug expressions. Shows the make up or lack of, in more ways than one. Whose head do you think will explode first, Trump’s or Bannon’s? I think it’s a toss up. 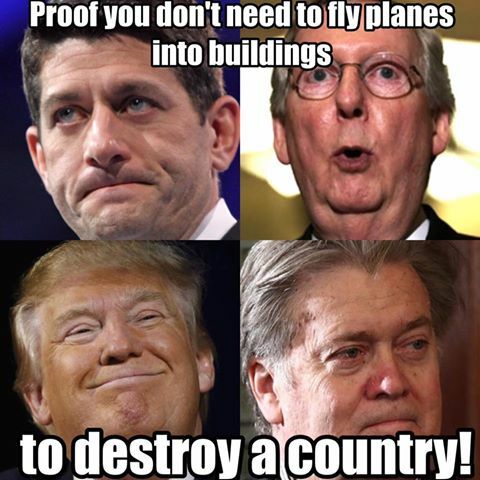 Their inflated egos are keeping them up in the air. One ugly rich white guy at a time…. Sometimes the truth hurts really, really deeply. How did this happen? Pinch me please. I know. What have we come to?